You'd be wrong if you think that how to upload MP4 to YouTube is a noob question or if you think you can upload every MP4 video file straight to YouTube successfully as MP4 format is supported by YouTube. We've soured a large number of forums to find the main problems people have run into when uploading MP4 to YouTube, and provided workarounds and solutions for these errors. 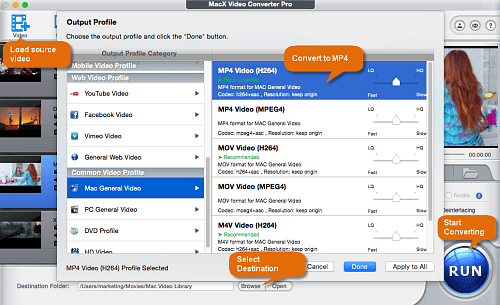 MacX Video Converter Pro, an versatile MP4 video converter can convert/edit/compress/repair MP4 video files and help upload MP4 file to YouTube faster without errors like unsupported file type, corrupted MP4 videos, stuttering upload process etc. MP4 is in the list of YouTube supported format, but some users still receive "invalid file format" error message when trying to uploading MP4 to YouTube. You should know that MP4 is a container format that can be encoded with many different types of codecs, such as Divx, H264, MPEG-4, H.263 and audio codecs AAC, MP4, AC-3, Vorbis etc. The best format for YouTube is is H.264/AAC MP4. You'll fail to upload MP4 to YouTube if the codecs are not compatible with YouTube. Check out your MP4 file information with free program MediaInfo. If it's in the wrong codec, decode the MP4 video to YouTube compatible format with the help of MP4 video converter. When I upload the mp4 to YouTube, the first part of the video (the part with animation) becomes a solid colour across the entire frame (switches between green, dark green, and grey). The final 5 seconds of the video (the final concatenated video) displays correctly. Corrupted or broken MP4 video won't be uploaded successfully to YouTube. Check out whether your MP4 video is corrupted or not by playing them with MP4 player. If the MP4 file is corrupted, follow to repair corrupted MP4 video and upload broken MP4 to YouTube without errors. "UPLOAD FAILED, VIDEO TOO LONG"
I just finished uploading an 18 min video and was then asked to verify my account. I have since verified it using my phone number. However, when I go to my VIDEO MANAGER to activate it; there's no option. Can someone please help me activate the 18 min video? You can upload a MP4 video up to 15 minutes by default. To upload longer MP4 videos, follow the steps below to verify your account. 1. Open the page https://www.youtube.com/upload, click "Increase your limit" link at the bottom. 2. Follow the instructions and click "Submit" to verify your account. It's very easy. The maximum file size you can upload to YouTube is 128MB. Many users report that MP4 videos take a long time to upload or are stuck halfway. The issue might be caused by big file size, or slow internet connection or heavy uploads traffic. You can compress the MP4 video size down for faster upload or change your internet server if it's an internet related issue, and avoid busy time/peak hours to upload MP4 video to YouTube. Your MP4 video is fine and the video audio format codecs are accepted by YouTube, but YouTube just stops processing and says "Published 0%" during uploading. It's probably not your reason that MP4 video stops processing when uploading to YouTube. High traffic on YouTube every day causes high heavy burden on the server. And it might be a bug that the YouTube system need to fix. Convert MP4 to YouTube supported MP4 codecs H.264/AAC without losing quality in 5x faster speed than others. Compress MP4 video to YouTube accepted file size or for much faster processing and uploading speed. Split/trim MP4 file for YouTube upload to solve "too long to upload" problem. Easily edit MP4 video, such as cropping, changing aspect ratio, adding watermark/subtitles, adjusting bit rate, frame rate, resolution and more. Step 1: Click "Add File" icon at the top left corner and select MP4 video files you'd like to convert to YouTube, or simply drag and drop the file. Step 2: Select an output format. Once the video is loaded, it will pop up an output profile window, allowing you to convert MP4 to YouTube format. You can choose MP4 Video (H.264/AAC) or head to YouTube Video, and select the best format for YouTube. Click "Browse" to select a destination folder to save the converted file if the default folder is not the proper one. Step 3: Click "RUN" to start to convert MP4 video to YouTube accepted format with the best video converter for smooth upload. A 4min 29s 4K UHD MP4 video is about 500MB. There's high chance that you need to compress video file size if your video is too long or in high resolution like 2160P 8K to meet YouTube upload requirement in video file size meantime to make MP4 video upload faster on YouTube. The MP4 to YouTube converter can convert video resolution, like changing 2160p 4K to 1080p, and compress MP4 video size without losing noticeable quality by adjusting video bit rate, frame rate etc. It's very simple to get started. All you need to do is to load your MP4 video, and click Edit to get the best YouTube video size for upload. There're lots of other useful tricks inside the MP4 to YouTube converter. You can crop and expand the video image, remove subtitles to MP4 video or add external subtitles to MP4 video, merge MP4 files or split MP4 video, trim the video file, to name a few. 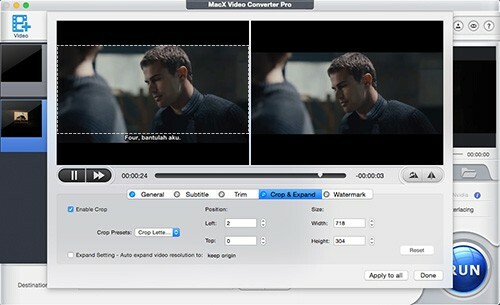 The MP4 to YouTube converting software can perfectly work as a powerful MP4 editor! 1. Open YouTube, sign into your account. 2. Click "Upload" icon at the top right corner and select MP4 video you'd like to upload to YouTube or directly drag and drop MP4 video file. And the video will start to upload. You can edit the basic info for the MP4 video, like description, tags. 3. When the video is finished uploading, click "Publish" to make your video live. Note: Your video will be blocked if it is copyrighted, and your account status might also be affected. 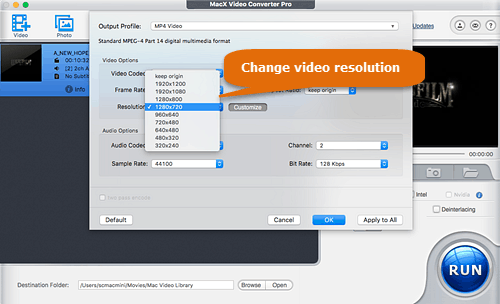 MacX Video Converter Pro, an all-around YouTube MP4 video editor/compressor/converter, can easily solve common MP4 upload errors on YouTube like unsupported file type, large file size, stuttering upload process etc. and help upload MP4 to YouTube fast without problems.